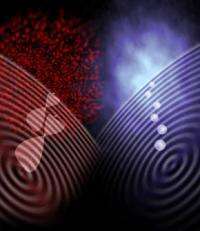 Artist's impression of the speckle pattern created by a multimode light beam (top, red), and the image measured in this experiment created by a multimode beam of atoms (top, blue). Source: Dr Tim Wetherell, ANU. (PhysOrg.com) -- Scientists have demonstrated for the first time that atoms can be guided in a laser beam and possess the same properties as light guided in an optical communications fiber. The researchers work has implications for future quantum devices that require smoothly-guided matter waves, such as atom interferometers which need to sensitively measure the earths gravitational field for geo-exploration. Their paper is published today in Nature Communications. In an optical fibre, many modes of light can be conducted simultaneously, and they can interfere to produce a speckled pattern of light, said team member Professor Ken Baldwin from the ARC Centre of Excellence for Quantum-Atom Optics at ANU. We have shown that when atoms in a vacuum chamber are guided inside a laser light beam, they too can create a speckle pattern - an image of which we have captured for the first time. The guiding behaviour agreed with a theoretical model developed by team member Mattias Johnsson. We have shown that atoms can be guided in a laser beam of light, with the same properties as light guided in an optical fibre made of glass, said Dr Johnsson. Speckle patterns produced by multiple independent light sources are a manifestation of the coherence of the light field. Second-order correlations exhibited in phenomena such as photon bunching, termed the Hanbury BrownTwiss effect, are a measure of quantum coherence. Here we observe for the first time atomic speckle produced by atoms transmitted through an optical waveguide, and link this to second-order correlations of the atomic arrival times. We show that multimode matter-wave guiding, which is directly analogous to multimode light guiding in optical fibres, produces a speckled transverse intensity pattern and atom bunching, whereas single-mode guiding of atoms that are output-coupled from a BoseEinstein condensate yields a smooth intensity profile and a second-order correlation value of unity. Both first- and second-order coherence are important for applications requiring a fully coherent atomic source, such as squeezed-atom interferometry. Well, you can bring atoms where you need them, then? Get the hell off here with your "txtspeak" and learn how to use punctuation and grammar. Though, for the record, I totally agree. Just do a "report abuse". the sooner they're reported, the sooner the posts are deleted. What's with all the quantum breakthroughs? Can anyone do something about this company which is clearly NOT from the US or Europe but a developing country outfit run by spamming criminals? Quit bitching about the spammers and start reporting them. yyz and I are the only that gave it a one so far. Give them a one and report them. The one tells you that you already reported them. Then click on the name go to activity and do the same for the rest its posts. Join the Few, The Proud, The Anti-Spammers. Huh...?? omg....i didnt noe atoms could go 'Quantum'.....big leap..!! Neat, this may be useful someday for solid printers. "Well, this is the essence of Quantum Mechanics that everything is both particle and wave. The heavier thing is the shorter its wavelength, that's why wave features are not usually detectable for anything except photons which are very light. But a long time ago there were experiments with electrons which demonstrated that they produce interference - if you send them through two holes onto screen they will produce interference pattern on this screen. BTW, that's why Einstein never believed Quantum Mechanics - he thought that idea that everything is a wave is stupid :-). So how does one predict the action of quantum particles? Apparently you use the Schroedinger equation or variants of it. Which is wave based. I am taking their word on this as the math is beyond what little I can do. Dr. Prins, who posts here occasionally, likes the idea that the wave is constrained by the boundary conditions and that when look we change the boundaries. Which seems to fit the evidence and math but Dr. Prins has gone a bit Cranky on this and superconduction, so while I like it as a way to think about it I have to take it provisionally, at best. I am pretty sure Einstein didn't think the wave idea was stupid. It was the statistical Uncertainty and the Copenhagen model that he couldn't stand.